Did you see that thing about that thing about that thing which Shaniqua told that guy who stuck his didgeridoo up her Manfred? What do you mean no? Don't give me ev-oes! Shut up and just watch this something about nothing Starring: Matt Lucas, David Walliams, and Ted Robbins. It was made in 2001 and lasted for a whole 45-minutes. Or whatever. STOP THE PRESS, POP-FANS! The pug-faced musician, Gary Barlow (Matt Lucas), has a cunning three step plan to get himself back into the charts again. Firstly, he'll announce on Sara Cox's prime-time radio-show, that he, plus the Irish virgin, Ronan Keating (David Walliams), will raise some money by producing a charity single for 'the blind'. Secondly, both he and the aforementioned virgin will promote the making of their chosen song -- 'I Can See Clearly Now' -- by standing in front of a fountain and smiling a lot. And last but not least, this not so dynamic-duo will join the chubby music producer, Pete Waterman (Ted Robbins), and then record this 'master-piss' one (piss) artist at a time. Boy-oh-boy! Now doesn't that sound just great? Huh? Though I do wonder what the singers in question think about all of this? Maybe bug-eyed television presenter, Jamie Theakston, should ask them? Ricky Martin -- Oh! You are a very naughty boy. Don't try to kiss me, wink-wink! Tom Jones -- Hello Boy-o. Simon and Garfunkel -- Bright eyes, burning like fire. You shmuck. Elton John -- That's it! I'm leaving. Eminem -- You're a ruddy fagot b*tch. Ooh! Controversial. Cher -- What film would you like to see? Press '4' on your telephone keypad now. Noel and Danny -- Wow! A door! I've never seen a door before. Graham Coxon -- I can hear voice in my head! The Bee Gee's -- SILENCE! I'm talking. Shirley Bassey -- Champagne darlings. Champagne for everyone. H and Lee -- We're from Steps. Tommy Steele -- Have we got a song for you? Prince -- Which one of you b*stards stole my guitar? Macy Gray -- I can't get away from those flies. Sting -- Please take Chief Ousaba away from me. He's been following me around for ages. Stevie Wonder -- I don't do charity. F*ck em. Errr... well... that's enough of that I think. But I do have to mention that this 'gala production' doesn't sail too smoothly given my benefit of hindsight. You see, after the first day's recording, Pete and the virgin decide to dump Gary, resulting in him singing a song with John McCririck (good). Geri Halliwell and Stephen Gately can't sing (take that comment any way you wish). Plus some unknown artist turns up out of the blue and does his own thing (whatever that is). Still, by in large everything does turn out into a bright -- bright -- bright, sunshiny dayyyyyyy! Picture the scene. Some time in 2002. Around Ten O'clock in the evening. And me and my younger brother, Anthony, are lounging around in our mutual bedroom, waiting to go to sleep whilst idly perusing the television channels. Then suddenly, as if by whim of fate, I flick it over to 'BBC2' and notice a rather strange show hosted by Jamie Theakston streaming out of the screen! 'Keep it on' yelped Anthony 'I like this chap. He reminds me of our cousin Costa from Cyprus'. In turn, I acknowledge my brothers yelp by laying back into my bed, and then watching this rather bold program called 'Rock Profiles'. OK, I have to admit, I can't for the life of me remember what episode we both watched that night; or what musician it was trying to spoof either. Nonetheless, from that moment on-wards, Ten O'clock was a staple in both of our tele-visual lives. And we just loved watching this really strange song-slanted satire. Alright. I know what you're thinking to yourself, dear reader. Why did we like this show so much, that we had to watching it again and again and again? Right? Well, just like this special -- 'Rock the Blind' -- there are a number of reasons really. (1) Although the two main stars of this show, Matt and David, can't really sing, and don't attempt to do 'straight impressions' as such -- it doesn't really matter within the scheme of things. What they do is still very funny, to the point that a 'realistic performance' doesn't even come into the equation. (2) I find that some of the pastiches work on a cartoon-ish level, and don't need to be expanded upon because of the mock-documentary structure this piece conforms to. Also, with Jamie Theakston playing 'the straight man' -- so to speak -- in many ways he reinforces the tone of the show in a very traditional manner. (3) By in large the majority of the impersonations are based on bastardized concepts and perverse execution. Prince sounds like Worzel Gummidge. Paul Simon sounds like Jackie Masson. Eminem and Ricky Martin sound camp. And Cher sounds like an automated answering service. Well, what's not to like? (4) Now I've to mention Tim Robbins role in 'Rock the Blind', don't I? Not only is he Paul McCartney's cousin, but he really does a great job of playing Pete Waterman as if he was some sort of second-hand car dealer. Plus his Spud is a right hoot too. (5) In hindsight, you can almost see how Matt and David subsequent television show, 'Little Britain', started to take shape after watching this special. Obviously their Shirley Bassey evolved into their 'Bubbles Devere' character. And you can say the same thing about some of their camp creations as well. No comment. 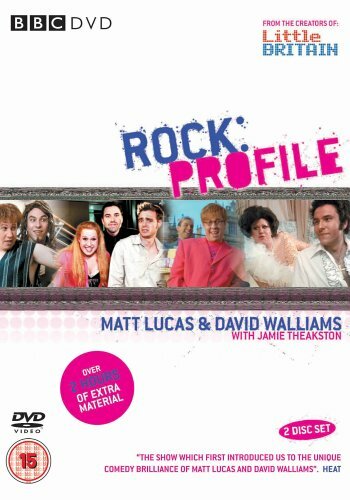 (6) It's a little know fact that Matt and David were commissioned to create 'Rock Profiles', so that it could be used as a 'jovial link' in between music videos on the new BBC channel 'UK Play'. Furthermore, this special took the place of a third series of this series by default. (7) In my opinion there was only two aspects about this flick that didn't come across too well. Firstly, I wasn't that keen on the 'unknown singer' section -- I felt that was very 'one tone' in execution. And secondly, the 'Rock the Blind' / 'I Can See Clearly Now' gag wasn't punchy enough to really take root. All in All 'Rock the Blind' is a great mock-documentary to watch, and is a must see for people who like laughing, music, 'Little Britain', camp humor, and any of Matt and David's other works. Don't you agree, Vicki?